Could the Windows 10 Creators Update make you dump Netflix and YouTube? Microsoft continues to bolster Windows 10’s media-playing credentials with the news that it will be including the ability to play 360-degree videos through the Movies & TV app when the Creators Update launches later this year. This new feature, which was spotted in a document that lists all the recent changes added to the Windows Insider program, states that users will be able to “get into the action with 360° videos – tilt or drag in any direction to look around. (Windows 10 Creators Update required)”. So, you’ll be able to use your mouse to click and drag 360-degree videos to look around in an immersive entertainment experience. It also mentions tilting, which could refer to moving a Windows 10 tablet around to view the 360-degree footage. It could also hint at virtual reality support. 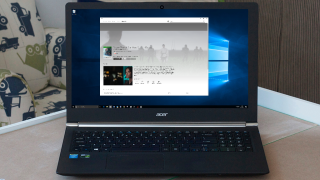 Earlier this week we reported that Windows 10 is getting some neat new tricks for film and music lovers with the Windows 10 Creators Update, and that trend of boosting the media-playing credentials of Windows 10 looks set to continue with this latest news. A 'Trailer gallery' is being added to the Movies & TV app that comes pre-installed on Windows 10, letting you view trailers of TV shows and movies available from the Windows Store (and keep up to date with upcoming releases which you can pre-order). The whole process of renting and buying movies and TV shows through the Windows Store has also been made more user-friendly, with all the videos you’ve rented or bought now grouped together on one page, while exploring movies and TV shows is made easier with video suggestions based on what you’ve previously watched. Microsoft appears to be keen to take on Amazon and Netflix with its streaming options, and YouTube and Facebook with its 360-degree video support. Additional support for video files, such as MPEG-2, is also coming, so it looks like Microsoft wants to make its Movies & TV app the only place you’ll need to go when you fancy watching something. Will these additions be enough? We’ll find out when the Windows 10 Creators Update launches later this year.